Improper loading is often a cause of Maryland trucking accidents, for a number of reasons. First, an improper truckload is one that is too heavy or imbalanced such that it inhibits the truck driver's ability to stop the truck. If the truck driver does not spread the load over the axles properly, breaking is compromised. Most rear-end truck accidents that our lawyers see come from drivers with full loads, whereas rear end truck accidents are far less common after the truck has made its deliveries. This is borne out by Insurance Institute for Highway Safety studies, which have found that loaded tractor-trailers take 20% to 40% longer to stop than cars. Their studies also discovered the obvious: the heavier the vehicle, the less likely it is to be able to stop in an emergency. Heavy loads also impact stability, and, as a consequence, the vehicle's ability to handle the road. 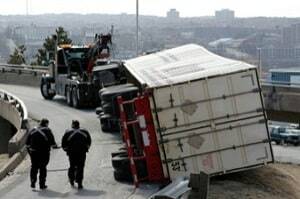 Overloaded or improperly loaded trucks are at higher risk for truck rollovers because unstable trucks cannot handle turns or lane changes as well. Obviously, if a truck turns too quickly, it is more likely to roll over if it is improperly weighted towards the direction of the turn. Our lawyers have also seen a number of cases where a truck tries to return to the road after letting a tire slip off onto the shoulder of the road. Federal law requires Maryland and other states to follow uniform truck safety regulations, and the failure to do so can result in the loss of much-needed highway funding. The Federal Motor Carrier Safety Administration is supposed to monitor states' compliance with federal law concerning truckloads' weight and distribution, but FMCSA does not have the resources to adequately monitor the 700,000 businesses and almost eight million trucks under their purview. Another thing s to consider in improper loading cases is that the load may not have been secured properly by the truck driver or his company, giving an injured plaintiff another possible defendant. Too often, the load on big trucks are properly and safely loaded and secured. Often, the load is unsafe simply on the fact that there were absolutely no cargo restraining devices used throughout the entire load. It is nearly impossible to safely unload an 18 wheeler van trailer if the cargo was improperly and unsafely loaded to begin with. This is also weapons for truck accident lawyers because often the truck driver and the truck loaders point to each other as the culpable party. It is well-established in the trucking industry that in loading and securing a tractor-trailer, a company is required by the industry standard of care to not only load and participate in the securement of the load to the extent necessary to avoid any dangerous imbalances. The trucking company has a duty to ensure that the tractor-trailer is free of any clear or obvious safety deficiencies, defects or safety risks that would cause the driver or members of the public to face an unreasonable or foreseeable risk of serious injury or death. If you have been seriously injured in a truck accident in Maryland, call one of our experienced truck accident lawyers at 800-553-8082, or get a free consultation.